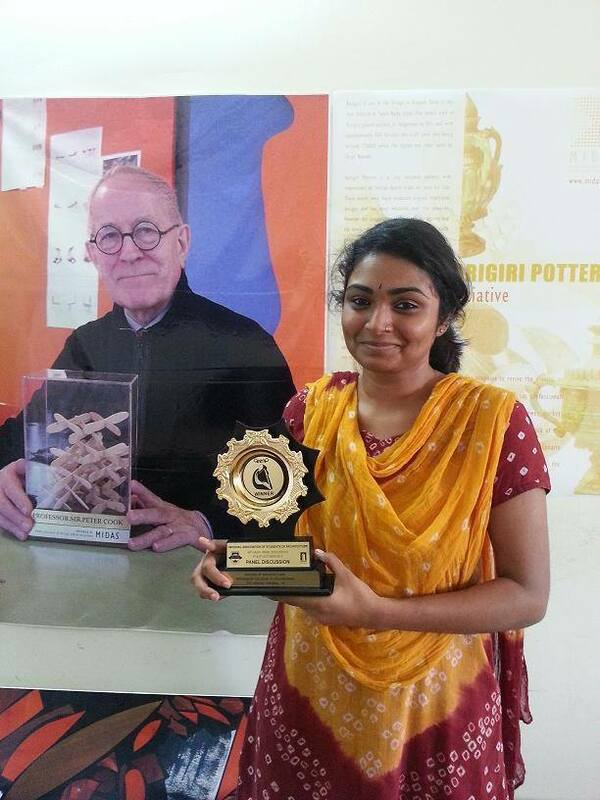 Congratulations MIDAS for winning Overall First Prize at NASA Pre-convention meet at Chennai. Both programs are affiliated to the Anna University of Tamilnadu and have been approved by the Council of Architecture, India. The Chennai-based MARG Ltd., one of India’s leading Infrastructure companies, has announced that its flagship project, MARG Swarnabhoomi, christened the city of education, research and innovation, is fast emerging a major education cluster. Swarnabhoomi Academic Institutions (SAI), a MARG education initiative, is aimed to address the global needs towards creating an equitable society by enabling young individuals to bridge the socio-economic divide. Affordable quality education, skills development & employability enhancement, training in identified industries, promoting the valued heritage & culture and vocational skills development are its key focus areas. SAI has embarked upon education ventures like Swarnabhoomi Academy of Music (SAM), MARG Navajyothi Vidyalaya, MARG Institute of Design and Architecture, Swarnabhoomi (MIDAS), and Virginia Tech – India Campus and Finishing School (EXCEL) in the cultural corridor consisting of Mahabalipuram, Auroville and Kancheepuram, renowned for its architectural inspiration. Besides, a Centre of Excellence in Sustainable Studies that will take a uniquely integrated look at parameters like water, waste management ,energy and green building initiative, is also on the anvil. 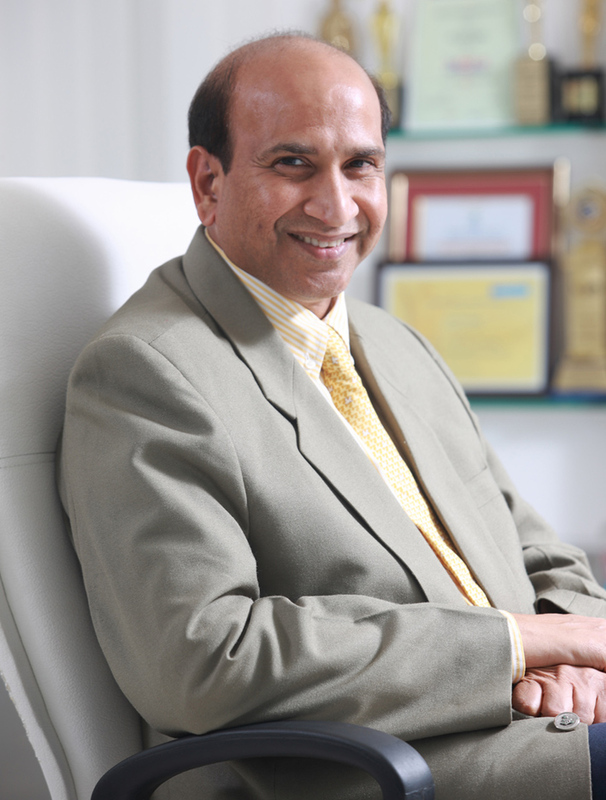 Mr. GRK Reddy, Chairman & Managing Director, MARG Group, said: “Our education initiatives are strategically located in the quite, green, pollution-free and pristine eco-system of MARG Swarnabhoomi. Also, the fact that students will be exposed to on-site training at the MARG facilities and project sites, extensive interaction with our international partners & faculty and that meritorious students will be absorbed within the MARG Group is a key differentiating factor. We are building 60 million sq. ft. of development, two airports at Bijapur and Bellary and two ports at Karaikal and Mugaiyur. This will be an excellent learning ground for our students”. MARG has entered into strategic tie-ups with international majors like PYCSA S.L of Spain, LAGAN Construction of Ireland, and the Los Angeles-headquartered and Fortune 500-listed AECOM and International Infrastructure Consultants (IIC). These international partners will interact on and off site with students and share best practices. Also, the Provision of Urban Amenities in Rural Areas (PURA) projects being undertaken by MARG in a phased manner will offer huge scope for students towards community development initiatives too. The pilot projects covering 11 village panchayats in Kancheepuram district of Tamil Nadu and eight village panchayats in the Karaikal region of Puducherry, benefitting over 80,000 people in total will help develop rural infrastructure like water supply system, sanitation facilities, village streets, and drainage and watershed projects, apart from placement-linked skill development activities. Mr. Ganesh Ram, Chief Executive Officer, MARG Swarnabhoomi, says: “Senior Managers at MARG have taken a pledge to dedicate 30,000 man-hours to the group’s education activities annually. This strong reserve of visiting faculty alongwith a research-based learning environment of MARG Swarnabhoomi, is meant to enhance the learning curve and make the students career ready”. MIDAS aims to provide excellence in architecture and design, focusing on nurturing, inspiring, and equipping the students with the best of knowledge, tools and training. MIDAS will cater to the needs of students from all over India and abroad. The courses offered in MIDAS are five-year Bachelor Degree Program in Architecture Studies and five-year Bachelor Degree Program in Interior Design Studies. In addition to standard courses in architecture and design, specialised continuing professional development (CPD) short-term courses for working professional architects are also on the anvil. SAM is India’s first professional music college for contemporary jazz, rock and world music and is on a par with major music colleges around the world .Operational for the past two years, SAM is planning to expand into various fine arts disciplines and become a deemed university dedicated to the field of music and fine arts to cater to over 1,000 students. MARG Navajyothi Vidyalaya, based on CBSE syllabus, will provide opportunity to the first generation school goers for quality education at an affordable cost. Started in June with about 200 children from 1st to 7th standard, the school will be expanded to offer the entire KG to 12th standard curriculum in the near future. EXCEL is a finishing school which offers industry-specific course curriculum and provides placement assistance. It aims at generating rural employment opportunities while offering composite and holistic career matrix to aspiring young talents. The other knowledge initiatives of MARG include Virginia Tech (India Campus) and Marine and Logistics Institute. The campus is designed on the same lines of Virginia Tech of the US with the objective of delivering programs in India for graduate education as well as scientific and technological engagement through a model of collaborative research, education and outreach that will address current and future global issues and create opportunities. MARG Institute of Design and Architecture, Swarnabhoomi (MIDAS), an educational initiative to address the global need for high quality architects by MARG, one of the fastest growing infrastructure companies in the country, organized a orientation programme to welcome the second set of new batch students who enrolled themselves into MIDAS through the counseling process in Anna University. The dignitaries attending the initiation program were Sandeep Mehta, President – CREDAI and MD, Jain Housing and Constructions Ltd., Dr. Bala Balachandran, distinguished Professor of Accounting and Information Management at the Kellogg School of Management at Northwestern University & founder and dean, Great Lakes Institute of Management, Dr. Ashrafi S Bhagat , Art Historian , Suhasini Ayer, Principal Architect, Auroville Design Consultants ,GRK Reddy, Chairman and Managing Director, MARG Group , Rajini Reddy, MD, Exemplarr Worldwide Ltd, and AP Ganesshram, CEO – MARG Swarnabhoomi and Education Services. While Mr. Sandeep Mehta, President – CREDAI, expressed views on the “Future in Architecture” , Dr. Ashrafi.S.Bhagat, Art Historian enlightened the audience on “South Indian Architecture” and Suhasini Ayer, Principal Architect, Auroville Design Consultants on “Sustainable Architecture / Building Technology”, continuing the session Prof. Jaffer AA Khan, Director, MIDAS, welcomed the 2012 batch and introduced them with the teaching pedagogy of MIDAS. 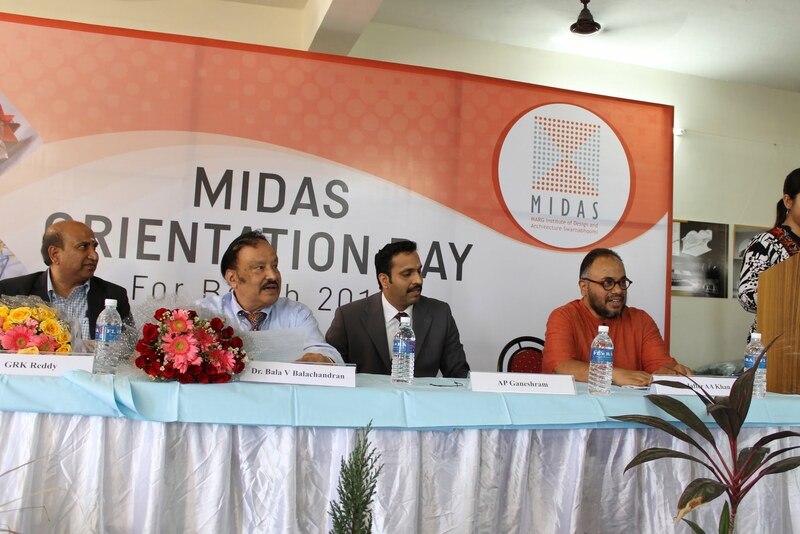 MIDAS organized this programme for the new batch of students to acclimatize them to the course curriculum as also to introduce the 2012 batch to the faculty. The new set of students will pursue 5 years Bachelor Degree Program in Architecture Studies (B.Arch – Architecture Studies). The program is offered in both day scholar and residential modes. All the approved seats are filled and students from all over the country have joined the second batch of MIDAS. MIDAS, a part of 1000 acre eco-system at MARG Swarnabhoomi has an exclusive built up area of 43,000 sq. ft which houses a well equipped library, a futuristic studio, large spacious classrooms plus audio and video learning support. The campus also has a swimming pool, basket ball courts, multi-purpose sports ground, convenio store, 24 hours clinic and health care gymnasiums. The curriculum at MIDAS is of International Standards and the Professors are from across the globe. This will enable every student to gain extensive knowledge with regard to international architectural standards and movements, right here in India. As a leading infrastructure developer, MARG recognizes the demand supply gap which exists between the exponential growth of infrastructure and the lack of good schools of architecture. The program is structured to facilitate students foray into specialized areas such as Retail Design, Lighting Design, Exhibition Design, Event and Set Design and Ergonomics. 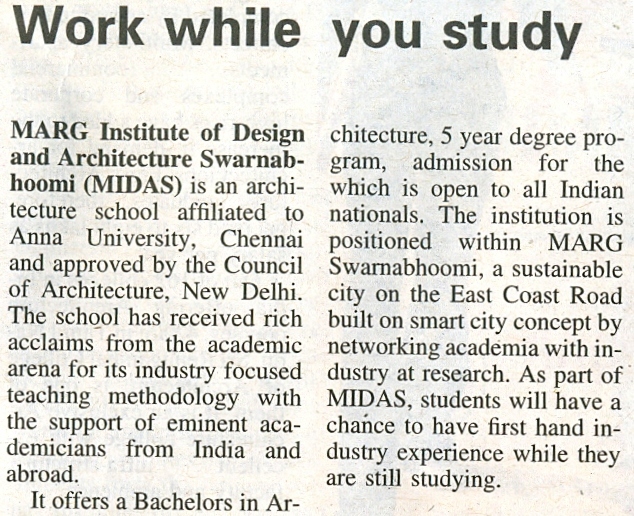 Designed to bring in the prevailing trends across the world, MIDAS is one of the few Schools in India to offer alternative career options to architecture students through integrated study. MIDAS is part of MARG Swarnabhoomi, a 1000 acre campus for education, research, innovation and industry. MARG Swarnabhoomi is being built on the concept of replicable model for a new city, students of MIDAS will have live experience on the finer aspects of architecture and have a 360 degrees learning of complete urban planning which includes, roads, drainage system, sewage, residential buildings, factory spaces, commercial complexes and landscaping etc. MARG Swarnabhoomi is designed to bring in innovation through close networking between industry and academia. Through this synergy, students will have up to-date information on industry happenings, latest trends, networking with professionals etc. The first year batch students at MIDAS recently organized a hugely successful 6 day exhibition at Lalit Kala Akademi in Chennai ( July 2012) to showcase their year end work. World renowned architect Mr. Sanjay Mohe critically appraised the student works during his visit to the exhibition and applauded the student’s works. MARG Institute of Design and Architecture, Swarnabhoomi (MIDAS) organized a orientation programme to welcome the second set of new batch students who enrolled themselves into MIDAS through the counseling process in Anna University.